Poets outside The Poet’s House, Portmuck 1995. Photo by Todd Rudy. 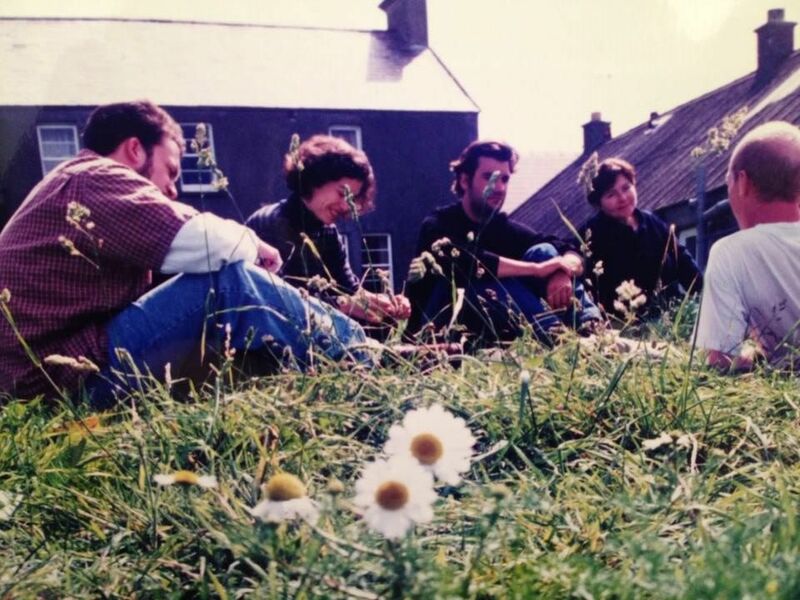 I had the good fortune to spend two weeks at The Poets’ House in Portmuck in 1995 (in fact, you can see me shouldering my way into the photo immediately below!) – fond memories indeed. 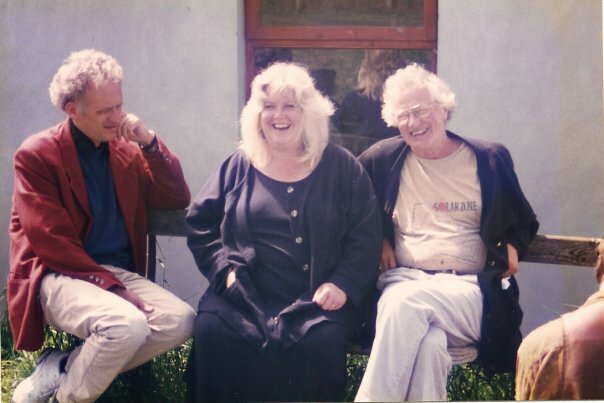 Janice & James Simmons with poet Paul Durcan (right) outside The Poets’ House, Portmuck. Photo by Todd Rudy. In 1980, I came to Ireland on an extended holiday and saw a castle in Lough Eske. The castle was for sale, and after having been the assistant director of the Frost Place in the United States, I thought that I would like a place as majestic as this castle to house the voices of American and Irish poets. The Poets’ House wasn’t to be for another ten years, when I visited Ireland again and discussed my idea with people at the Project Art Center. I wanted to acknowledge and foster the differences among poets writing in English in a writing center in Ireland where poets could discuss craft and process. In 1990 that center was born, the brain child of me and my partner James Simmons, who believed in my visions and joined in my journey to realize this one. The Poets’ House in Port Muck, Islandmagee, Country Antrim opened to poets from all nationalities, all walks of life. The house looked out onto the Irish Sea, and beyond that, Scotland. So the workshops in our center would look out onto pods of dolphins in the little harbor beyond our doors. At first, there were only a few gathered. During its first summer term, the poets in residence included Seamus Heaney, John Montague, Anthony Cronin, Paul Durcan, Peter Sirr, Derek Mahon, Moya Canon, Paula Meehan, Theo Dorgan, Simon Armitage, and Carol Ann Duffy. Among the students were Matthew Donovan, Daryl Armitage, Nessa O’Mahoney, Denise Blake, Moyra Donaldson, and Michelle Mitchell-Foust, who came back to The Poets’ House as an American Poet in Residence after being a student in the program. Each session that followed that first year had an American Poet in Residence, and these poets include Sherod Santos, William Matthews, Jean Valentine, Roger Weingarten, Ralph Angel, and Billy Collins. The Poets’ House sessions, three a summer, were structured as lectures, workshops, and readings, with each day featuring a different poet. The poet lectured in the morning, conducted a workshop in the afternoon, and gave a reading in the evening. Students had one day off per week so that they might have the opportunity to travel to gorgeous destinations as part of the course– places such as the Giant’s Causeway and Dunluce Castle. Students from all over the world learned from an array of topics, including Irish folklore, the sounds of Irish birds, science poems, the God vision, and curse poems. Students learned of poets of all periods and all languages, such as Lorca, Pound, Rilke, Dickinson, Mandlestom, and Dante and Dante’s revisionists. For years, students heard Michelle Mitchell-Foust’s lectures on contemporary American poets who are women who question of boundaries of twentieth-century poetry: Anne Carson, Alice Notley, Susan Howe, Brenda Hillman, Claudia Keelan, and Ann Lauterbach. The days were rich with poetry, and the nights were rich with singing. James Simmons was a gifted poet and singer, and under his direction, we sang for the faculty and students and with them, and we created an environment that lent itself to the growth of poetry. After three years, we knew that the Poets’ House could be expanded to include an MA program, the first in Ireland to be awarded for creative writing. The Poets’ House partnered with Lancaster University to build this graduate program. The program graduated sixty students, among them Heather Wood, Paul Grattam, Joe Woods, Matt Donovan, and Adrian Fox. Our faculty included Martin Mooney, Medbh McGuckian, Paula Meehan, Bernard O’Donahue, and Eilean Nichuilaanain. Suffice it to say that no program in Ireland or America at the time could provide the kind of experience that poets at The Poets’ House could provide. With the Simmons family at its center, the summer and MA courses educated poets at the same time as they fostered them. No one, not even the faculty, left The Poets’ House without being touched by the magical foundation it provided. A child’s question — Who am I? A new self in the Old World; I’m changed. The arm of a wild Atlantic still before me. Bar Harbor or the mouth of Belfast Lough? and occasional letters from home. The seals, I imagine, are messengers from Maine. tilting sideways like dogs listening. Otters in the blue inlets that glow with afternoon light. the water, rock and harbour wall below. This is an island, her people calling out to sea. All other lands are imagined, all other peoples. These boundaries are defined by nature. My urge to move west has left me. Maybe I’ll never see California. to leave Portmuck for Belfast. whose songs I’m still learning. This is more difficult than I imagined. First there was poetry and then love — they came easy. or New England’s native Algonquins. than all the old songs of the Irish. colder winters, hotter summers, extremities. the same big shining sea. It is fierce with life. hurling down the long strand at Tramore. lay dead on the strand. I swam until brine burned tongue and lips. fierce in that water, as children must be fierce. alive with energy to burn. and pointed the moth out, but couldn’t. rested on the white wall of the cottage back garden. A great arc of sunlight caught the moth’s wings. to be a sign for seasons, for day and years. James Simmons, Portmuck. Photo by Todd Rudy. My daughter says, ‘Don’t smoke, Daddy. with life, given I’m still strong and healthy? with words and music. These good songs will be sung. is to search the bushes. I smile and smoke. of bees, then pansy, rose, chrysanthemum. by touches of blight, of failure in leaf or root. but bloom, bear fruit, shrink back slowly and wait. Our lives seemed overtaken by one flower. frozen, melted, raised up in the flower-smelling. The two of us at the dark door of our dwelling. Looking at nothing, that imminence outside. of the porch that morning. or love, or thinking poetry. her steps on grass were silent. His curiosity is good fun. have the sound there marking out the time. is not organic—the garden goes to seed. like Berryman, be haunted by its ghost. the truth without that drum-beat in your ear? over sand, were Janice’s eyes today. early gives her a luminous ash-blond halo. kissing awake a sleeping girl who shrieked. and now that wakened princess is my lover. but the years didn’t seem to have taught me well. and yet I couldn’t close my ears. I had to listen, and I learnt by heart. On my first day of teaching at the Poets’ House, I found myself in an old Irish one room house-turned conservatory. At the far end of the room was a fireplace with a turf fire smoking. That end of the room got light from a window. On the windowsill, the tea was brewing. Before me sat a group comprised of an Irish bilingual senior citizen farmer, an Irish mother of seven, a younger Irish mother and her ten-year-old child, a distinguished Irish gentleman from the town, who was also an Irish language speaker, a young Irishman from Belfast, and several graduate students, one from Canada, and two of my former students who had come from the states at my suggestion. The graduate students were enrolled in the course as part of their M.A. in creative writing through Lancaster University. In every way, the setting was ideal, complete with the sea outside the window. And the mix of students was something I was accustomed to from my teaching of creative writing classes at Fullerton College in California, only the Poets’ House had significantly fewer English Learners. I would be delivering a lecture in the morning, which might include a writing exercise, and conducting a workshop in the afternoon. I would give or attend a reading in the evening. I knew from my experience of attending the Poets’ House courses as a student what student expectations might be like. I also knew that students from Ireland and students from America and Canada would expect different things and acquire different facilitating. I knew that all of the students were eager to have an audience for their work, and they were a mature group of people (even the child seemed wise beyond her years). Therefore, I knew that they would respond well to a supportive and constructive workshop setting, which is a necessary community for each writer. They would benefit from my completion of an M.A. and a Doctorate in Creative writing, where I had the opportunity to teach creative writing classes at University of Missouri-Columbia. I had a fairly traditional approach at MU, having students bring in copies of poems for written and verbal critique by myself and their peers in a workshop environment. I would later teach themed creative writing courses and cross-genre courses. And I would make writing and its process the focus of our time in the classroom, with 40% of the time dedicated to critique. I wrote a book-length manuscript of my own prompts for this purpose. In the Poets’ House workshop, issues of syntax, diction, and form were open for discussion. We paid special attention to the nuances of point of view, as they are outlined in Orson Scott Card’s Character and Viewpoint, considering the telepathy and the global reach of the discourse. Readers made suggestions for revision and developed their critical evaluative skills. It was especially exciting to discuss the richness of the Irish language and its elasticity as well as the many American slang terms and colloquialisms that turn up in poems. On occasion I also asked students to discuss poems in affinity groups. I supplemented this course with reading in poetry texts such as Stephen Dobyns’ Best Words, Best Order so that students had a resource for the terminology and the genre conventions as well as examples of the forms. (Reading is as important as writing for students in writing classes!) I did not lecture the class on prosody, preferring instead to discuss relevant craft issues as the need arose during our discussion of the poems. One of my fondest memories involves one of the writing workshops in Donegal. A student brought her little daughter and her daughter’s friend along, so I decided to have the students write out ghost stories as a warm-up or a pre-writing exercise, so we all broke up the circle to travel to places around the house. The little girls went under a bush in the back yard to do their writing. When we all came to together, I started with the little girls. The one with the red hair had a wild tale of the “Fenchi”. She said she had found the most frightening book in the world, and she had taken it to school to scare all of her classmates with the “Fenchi”. The book said that if you put a piece of furniture, such as a chair, in the wrong place in your house, the “Fenchi” would come for you. Even as the girl read her story, she shivered with her residual fears. It took some discussion for me to discern that the little girl was talking about a book on Feng Shui! The book based on the Chinese customs for “harmonizing your living environment” absolutely terrified the girl and her classmates! Furthermore, for our course in Donegal, we also had access to an impressive library of contemporary Irish, English, and American poetry at the Poets’ House. But the primary texts were the students’ poems. Where the challenges came in involved pacing and rigor. American students were use to faster-paced courses with more stringent and involved writing and reading requirements. They were quicker to use the poetry vernacular and to refer to schools of poetry. Irish students were especially strong during discussions of poems; they liked to take their time during their critiques, and they were better read than their American peers, so that they were able to draw from their readings during their verbalizing of recommendations. These strengths on the part of all students made for excellent teaching experiences. During the ten years that I taught at the Poets’ House during their summer sessions, I had the opportunity to team-teach the workshop with other Irish poets and American Poets-in-Residence. For one summer course, I taught with Billy Collins, and it was an extremely rewarding experience for everyone involved. We were able to take a few “field trips” as part of this course, including a couple of memorable ones to a 7th century grave yard about a mile from the Poets’ House, where one American student was able to find an ancient ancestor’s grave, and we saw a rainbow at midnight. Because we teachers were working with the students each day of the course for the entire day and evening, we could refine our discussions and make sure that students received feedback in a group settling, on field trips, and during one-on-one conferences with me. The Poets’ House was the optimal setting for teacher-student communication about the students’ creative process. As a Professor of English, teaching literature and creative writing, my pedagogy asks for dedication to educating as a question of human communication and its improvement and preservation. I resist the notion that education employs only a transmission of knowledge. We are talking about human communications that are working their way toward the beautiful and the sublime. joined to take this beauty down. Janice Fitzpatrick Simmons was born in Boston and took her MA at the University of New Hampshire. She is a former Assistant Director of The Robert Frost Place in New Hampshire. In 1990 she co-founded The Poets’ House in Portmuck, Co Antrim. She received The Patrick and Katherine Kavanagh Fellowship in 2009 and The Royal Literary Fund Bursary in 2010. She has published five collections of poetry, her most recent being St. Michael and the Peril of the Sea (Salmon Poetry). 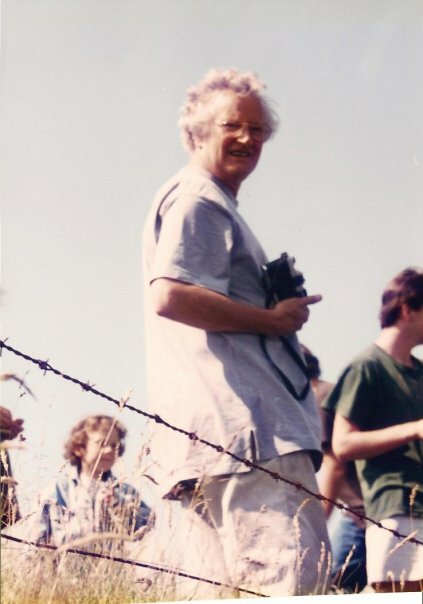 James Simmons was born in Londonderry in 1933 and died in Donegal in 2001. He taught for three years in the sixties at Ahmadu Bellow University, Nigeria. On his return he lectured in drama and Anglo-Irish literature at the New University of Ulster. He founded and edited the literary journal The Honest Ulsterman. He published numerous poetry collections of poetry with The Bodley Head, The Blackstaff Press, and Salmon Poetry. The Selected James Simmons (edited by Edna Longley) was published in 1978 (Blackstaff Press) and Poems, 1956-1986 was published by The Gallery Press in 1986. He published a critical study of Sean O’Casey (New York, St Martin’s Press, 1983) and released four LPs of his songs. Michelle Mitchell-Foust is an American poet whose published works include Circassian Girl (Elixir Press), Imago Mundi (Elixir Press). She and Tony Barnstone edited the anthologies Poems Dead and Undead (Everyman Press) and Monster Poems: Poems Human and Inhuman (Everyman Press), which will be out in September, 2015. She was a student at the Poets’ House in 1992, and an American Poet in Residence at the Poets’ House for ten years.